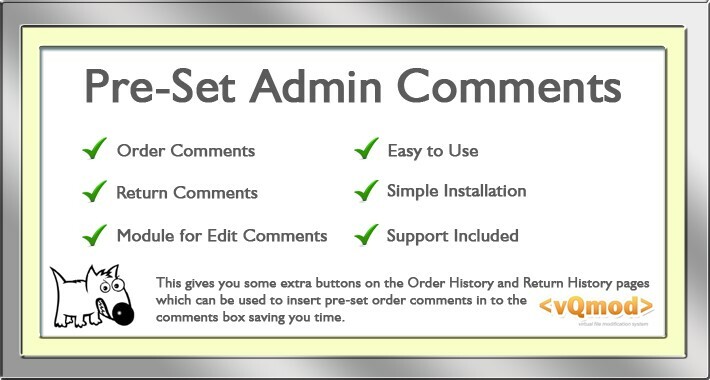 This gives you some extra buttons on the Order History and Return History pages which can be used to insert pre-set order comments in to the comments box. For 1.5x there are 2 versions of each extension included: a 6 button version and a 20 Button. The Admin History pages will only show the number of buttons that you actually use so even if you install the 20 button version and only use 1 button, then only 1 button will show on the history page. For 2.x on the number of buttons is infinite, have as many or few as you need. If you often have to add the same comments to orders and/or returns then this makes life a little easier. The comments can be managed from modules (Extensions > Modules) and you can set upto 6 or upto 20 (depending which version you use) different comments. You can set your own Titles for the buttons so that you can see which button adds which comment.